Rachel Vincent is one of my favorite authors. I knew I had to read this one and snagged it at the library not too long ago! Check out my review below. 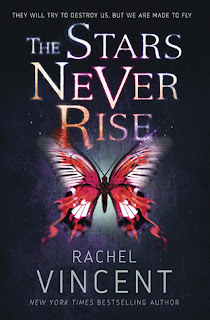 The Stars Never Rise is book one in a series that revolves around a world ruled by the Church and the fear of demonic possessions. I wasn't really sure what to expect when I started The Stars Never Rise but I quickly got engrossed in Nina Kane's story. This book revolves around Nina Kane, a 16-year-old in a small town called New Temperance. Nina and her sister are pretty much on their own since their mother stays at home all day dazed out of her mind. Nina is considering joining the Church and becoming a teacher, so she can better help her younger sister in life. The Church is part of what intrigued me the most about this book. The members of the Church run the city all because demons wiped out a good portion of the human race back in the day. So as one would expect we have a town full of people that do not want any sins to occur, and exorcists walking around ready to take out the demon possessed. I felt like if anyone stepped majorly out of line, they'd be convinced of having a demon inside of them and punished even if they really weren't possessed. It reminded me of the Salem witch trials. Nina is walking home one day when a demon comes out of nowhere and tries to attack her. She's saved by a guy her age that exorcises the demon. Not wanting her name attached to it, she makes a run for it. But that surely isn't the last time she sees the boy. Events unfold and Nina winds up on the run from the Church. She teams up with the boy that saved her (Finn) and his group of exorcist friends. Secrets that the Church has been hiding from everyone are revealed and the story just kept my attention the entire way through. 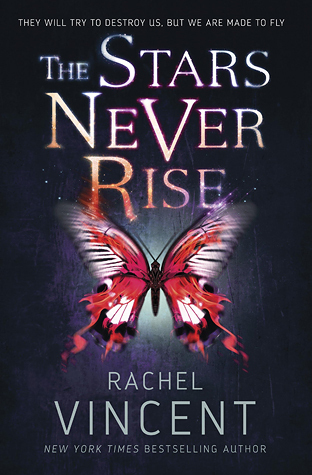 The Stars Never Rise is a YA dystopian with demons mixed in. 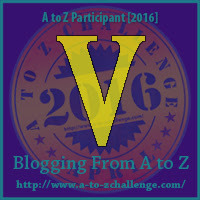 It's a bit different from the other books I've read by Rachel Vincent, but it worked really well. The pacing was executed well, I never felt like it was too slow or too fast. And I felt like the book showed a lot of Nina and her traits. The world was built nicely, even though I'd never want to live there I felt like I was there while reading. This was a pretty solid read and I'd recommend this book if you're a fan of YA and dystopian books! I love Rachel Vincent. I've read all of her adult books and think each series is better than the last. I've yet to try any of her YA stuff, but I think I might have to give this one a try. I read Brandee's review earlier this year that I need to move this up on my TBR list and your review confirms it. I think you'd enjoy it for the most part! It's YA but the demons balanced it out enough for me that I loved it! You had me at "demonic possession." I've never heard of this but am always fascinated by possession. I once worked in a psych hospital where we had a patient who believed she was possessed after being involved in a voodoo ritual. It was pretty terrifying. That would have freaked me out so bad! Sounds like a well written and nuanced book. Demonic possession and exorcism are both big things in the rural, less educated areas of my home state. I remember seeing something on the news for the DFW area. That someone was doing an exorcism in a park lol That was new to me, can't say I've seen it all that much here. Interesting take on a dystopian. Demons. I've heard of zombies and environmental degradation, but demons... I like that. I don't know if I would have picked up this book with revolving around the church. But reading your review, it sounds like a very interesting story. Thank you! That's why I was hesitant, but it was so good! I was thinking witch trials too so I giggled when I read your comment on that. This sounds really interesting. I enjoy dystopians that mix in a little paranormal. I bet I may enjoy this one. Great review!